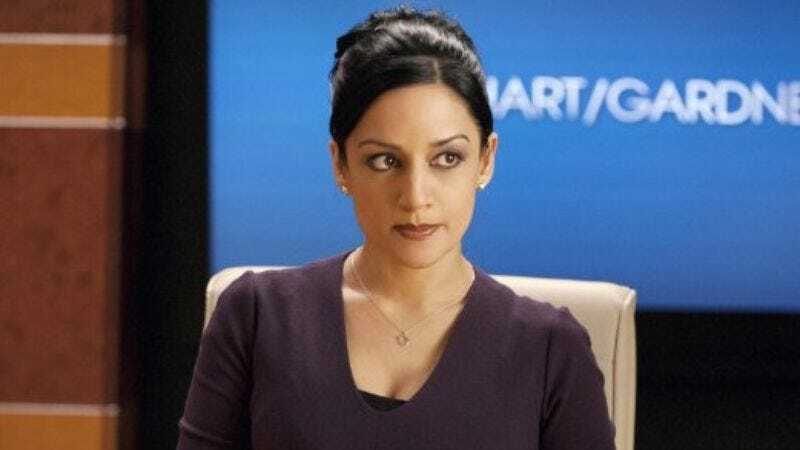 After parting ways with The Good Wife at the end of the show’s sixth season, Archie Panjabi is set to return to television as Lieutenant Knox on Brooklyn Nine-Nine, where she will reportedly have her eye on Joe Lo Truglio’s accident-prone and food-loving Detective Boyle. While she had a small recurring role on the BBC crime drama The Fall, this marks the first major television gig for Panjabi since the end of Kalinda Sharma’s six-season reign of solving cases and wearing leather jackets on The Good Wife. (Panjabi won an Emmy for the role in 2010.) Her departure wasn’t without its drama, as by the end of her tenure, Kalinda and Alicia—once the most compelling relationships on the series—stopped having scenes together. And when they did, it was all fake, due to reasons that can probably only be uncovered by a real-life Kalinda Sharma…or divine intervention. Shortly after the announcement, Panjabi tweeted that she’s happy to be returning to comedy. While we can’t expect Lieutenant Knox to be a Kalinda Sharma 2.0, we at least hope that the kind costume folk at Brooklyn Nine-Nine have the good sense to put Panjabi back into leather jackets and high-knee boots. Season three of Brooklyn Nine-Nine returns Sunday, September 27 at 8:30 p.m. on Fox. Panjabi is set to appear in the season’s second episode, slated to air October 4.